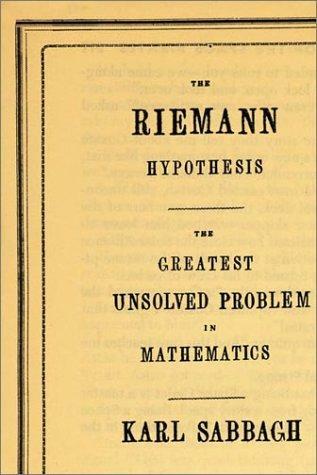 The simultaneous appearance in May 2003 of four books on the Riemann hypothesis (RH) provoked these reflections. We briefly discuss whether the RH should be added as a new axiom, or whether a proof of the RH might involve the notion of randomness. Are there important mathematical propositions for which there is a considerable amount of computational evidence, evidence that is so persuasive that a physicist would regard them as experimentally verified? Yes, I believe there are. z(s) º Ã¥nn-s = Ã?p 1/( 1 - p-s ). 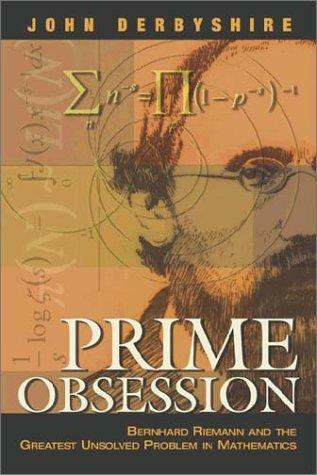 John Derbyshire, Prime Obsession, Joseph Henry Press, 2003. Karl Sabbagh, The Riemann Hypothesis, Farrar, Strauss and Giroux, 2003. Julian Havil, Gamma, Princeton University Press, 2003. 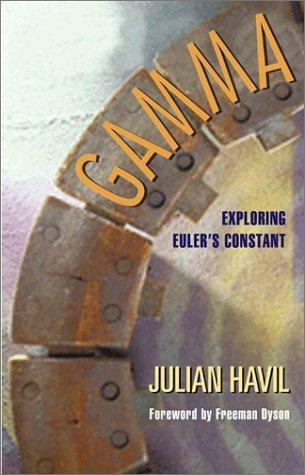 (Supposedly this book is on Euler's constant g, not the RH, but ignore that. The Riemann zeta function is like my W number: it captures a lot of information about the primes in one tidy package. W on the other hand is a single real number that contains a lot of information about the halting problem. Of the authors of the above four books on the RH, the one who takes GÃ¶del most seriously is du Sautoy, who has an entire chapter on GÃ¶del and Turing in his book. In that chapter on p. 181, du Sautoy raises the issue of whether the RH might require new axioms. On p. 182 he quotes GÃ¶del,* who specifically mentions that this might be the case for the RH. And on p. 202 of that chapter du Sautoy points out that if the RH is undecidable this implies that it's true, because if the RH were false it would be easy to confirm that a particular zero of the zeta function is in the wrong place. Later in his book, on pp. 256-257, du Sautoy again touches upon the issue of whether the RH might require a new axiom. 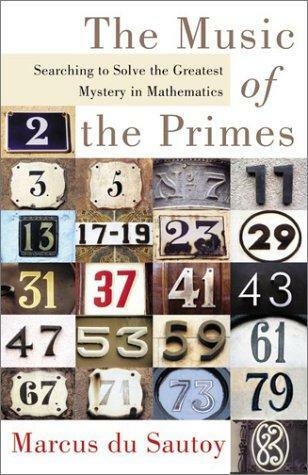 He relates how Hugh Montgomery sought reassurance from GÃ¶del that a famous number-theoretic conjecture---it was the twin prime conjecture, which asserts that there are infinitely many pairs p, p + 2 that are both prime---does not require new axioms. GÃ¶del, however, was not sure. In du Sautoy's words, sometimes one needs "a new foundation stone to extend the base of the edifice" of mathematics, and this might conceivably be the case both for the twin prime conjecture and for the RH. that turned up in a proof that an important conjecture must fail for extremely large cases. The conjecture in question was Gauss's conjecture that the logarithmic integral Li(x) is always greater than the number p(x) of primes less than or equal to x. This was verified by direct computation for all x up to very large values, and was then refuted by Littlewood without exhibiting a counter-example, and finally by Skewes with his enormous upper bound on a counter-example, raising the horrendous possibility that even though Gauss's conjecture is wrong, we might never ever see a specific counter-example. In other words, we might never ever know a specific value of x for which Li(x) is less than p(x). This possibility would seem to pull the rug out from under all mathematical experimentation and computational evidence! However, I don't believe that it actually does. The traditional view held by most mathematicians is that these two assertions, P ¹ NP and the RH, cannot be taken as new axioms, and cannot require new axioms, we simply must work much harder to prove them. According to the received view, we're not clever enough, we haven't come up with the right approach yet. This is very much the current consensus. However this majority view completely ignores* the incompleteness phenomenon discovered by GÃ¶del, by Turing, and extended by my own work on information-theoretic incompleteness. What if there is no proof? Someone recently asked me, "What's wrong with calling the RH a hypothesis? Why does it have to be called an axiom? What do you gain by doing that?" Yes, but that's beside the point, that's not the real issue. The real question is, Where does new mathematical knowledge come from? Let me put it this way: Yes, I agree, mathematics and physics are different, but perhaps they are not as different as most people think, perhaps it's a continuum of possibilities. At one end, rigorous proofs, at the other end, heuristic plausibility arguments, with absolute certainty as an unattainable limit point. In spite of the fact that I regard the Riemann hypothesis as an excellent new-axiom candidate---whether GÃ¶del agrees or merely thinks that a new axiom might be needed to prove the RH, I'm not sure---let me briefly wax enthusiastic over a possible approach to a proof of the RH that involves randomness. Disclaimer: I'm not an expert on the RH. What I'm about to relate is definitely an outsider's first impression, not an expert opinion. A possible attack on the Riemann hypothesis? Here is a concrete approach to the RH, one that uses no complex numbers. It's a probabilistic approach, and it involves the notion of randomness! It's originally due to Stieltjes, who erroneously claimed to have proved the RH with a variant of this approach. The MÃ¶bius m function is about as likely to be +1 or -1 (see Derbyshire, Prime Obsession, pp. 322-323). = (-1)number of different prime divisors of n if n is square-free. M(n) º Ã¥1 £ k £ nm(k). M(n) = order of n1/2 + e.
This approach for a possible attack on the RH caught my eye while I was reading this May's crop of RH books. I have always had an interest in probabilistic methods in elementary number theory. This was one of the things that inspired me to come up with my definition of algorithmic randomness and to find algorithmic randomness in arithmetic in connection with diophantine equations. However, I doubt that this work on algorithmic randomness is directly applicable to the RH. Mark Kac, Statistical Independence in Probability, Analysis and Number Theory, Carus Mathematical Monographs, vol. 12, Mathematical Association of America, 1959. George PÃ³lya, "Heuristic reasoning in the theory of numbers," 1959, reprinted in Gerald W. Alexanderson, The Random Walks of George PÃ³lya, Mathematical Association of America, 2000. D. Hawkins, "Mathematical sieves," Scientific American, December 1958, pp. 105-112. As PÃ³lya shows in the above paper---originally American Mathematical Monthly 66, pp. 375-384---probabilistic heuristic reasoning can do rather well with the distribution of twin primes. By the way, this involves Euler's g constant. Can a refinement of PÃ³lya's technique shed new light on m and on the RH? I don't know, but I think that this is an interesting possibility. By the way, P ¹ NP also involves randomness, for as Charles Bennett and John Gill showed in 1981---SIAM Journal on Computing 10, pp. 96-113---with respect (relative) to a random oracle A, PA¹ NPA with probability one. Borwein and Bailey, Mathematics by Experiment, Experimentation in Mathematics, A. K. Peters, 2003. Tymoczko, New Directions in the Philosophy of Mathematics, Princeton University Press, 1998. Chaitin, From Philosophy to Program Size, Tallinn Cybernetics Institute, 2003. John L. Casti, The One True Platonic Heaven, John Henry Press, 2003.